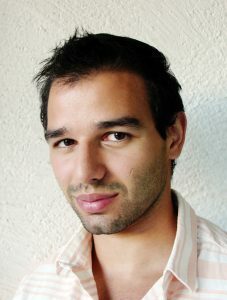 Sofien Bouaziz completed his thesis work at EPFL in 2015. His thesis results lead him to co-found the EPFL spin-off faceshift AG, a company that brought high-quality markerless facial motion capture to the consumer market. Their software was able to analyze face motions, and to describe them as a combination of basic expressions, plus head orientation and gaze. This description could then be used to animate virtual characters for use in movies or games. The company was finally acquired in 2015 by Apple. Sofien got then a research scientist position at Apple where he developed and productized the real-time face tracking algorithm powering the iPhone X Animojis and also available to third-party developers through ARKit. His thesis on real-time face tracking and animation was awarded the 2016 SIGGRAPH outstanding doctoral dissertation award honorable mention, the 2015 ETHZ Fritz Kutter PhD thesis award, and the honorable mention of the 2015 EPFL Patrick Denantes PhD award. His current research interests include machine learning, computer vision, and computer graphics. Sofien has a very strong publication record with many SIGGRAPH and EG papers. His work is influential and well cited, with a steeply increasing rate. His 2011 paper on real-time performance-based facial animation precomputes a blendshape model of the user’s facial expression space and then allows real-time tracking of expression from noisy RGBD data by solving for the most likely parameters given the observed 2D and 3D data. Then, his paper on modelling for real-time facial animation, published in 2013, presents a real-time facial expression capture system from RGBD data, which, unlike their earlier work, requires no user-specific training or calibration. In it, a dynamic blend-shape expression model is continuously refined as tracking progresses. His 2015 paper on real-time fitting of a 3D articulated hand model to depth images uses depth, silhouette, temporal information, and priors including a database of realistic hand poses to obtain a suitable fitting. Apart from face and hand tracking, Sofien Bouaziz has explored numerous other topics. His 2013 paper on sparse iterative closest points, proposes a nice principled approach for ignoring outliers and missing data. His 2012 work on shaping discrete geometry with projections allows efficient manipulation of geometric shapes described by points, triangle meshes, quad meshes, or tetrahedral meshes in a unified setting. The key idea is to use two concepts: a shape proximity function and shape projection operators resulting in a fast local-global solver. His 2014 Projective Dynamics paper extended this approach to real-time simulation of deformable materials building a bridge between nodal Finite Element methods and Position Based Dynamics. Sofien Bouaziz has published an extremely impressive set of research papers proposing algorithms that have had strong academic impact and that are now featured prominently in consumer products. He has a recognized level of competence, curiosity, and creativity that stands out above many other researchers. Eurographics is pleased to recognize Sofien Bouaziz with the 2018 Young Researcher Award.